Ex-Apple Designers Ask: What Product Saved Apple? 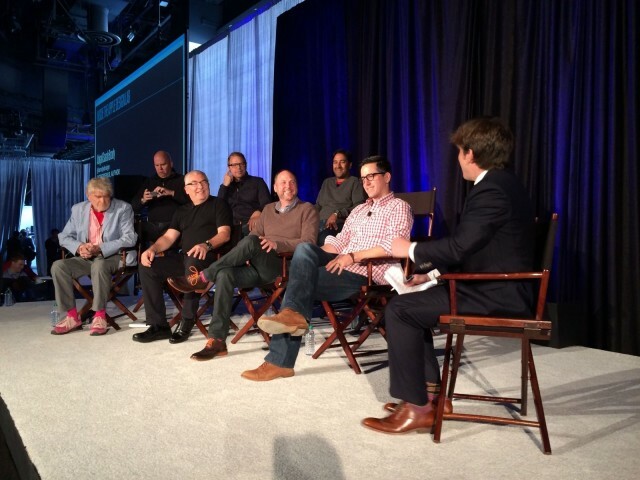 Fast Company's panel of ex-Apple designers. Photo: Leander Kahney. SAN FRANCISCO — Apple went from being chump of the tech world to champ, and what was the product that turned it all around? That was the question posed to a panel of ex-Apple designers at a special event here in the city. The question was posed at Inside Apple’s Design Lab, a panel discussion at Fast Company’s Innovation Uncensored, a cleverly-named one-day conference about design and innovation (clever, because it promised to lift the cloak on Apple’s infamous secrecy). Before a full house at the Metreon Center, the panel consisted of Robert Brunner, designer of Beats headphones and former head of Apple’s Industrial Design studio and now at Ammunition Group, and Hartmut Esslinger, founder of Frog Design and Apple’s first world-class designer. There was also Abigail Sarah Brody, who designed the first iPhone UI, Nitin Ganatra, who helped craft OS X’s early interface, Andy Grignon, the iPhone’s hardware engineer who has some colorful tales about the glitchy first prototypes, Tim Kobe, who helped Steve Jobs design the first Apple stores, Dave Morin, CEO of Path who worked in Apple’s marketing department, and Jeff Zwerner, one of Apple’s packaging experts. So which single product put Apple back on the path to success? iTunes on Windows: Because that blew the doors open. It’s a great list, and very debatable. iTunes and the stores are not something most people would suggest, but they are great candidates. What do you think? What was Apple’s most important innovation of that era? Leander’s new book about Jony Ive and the Apple design studio is out in November. ‘Jony Ive: The Genius Behind Apple’s Greatest Products’ is available for pre-order on Amazon.